Spring return handles for instrumentation valves protect personnel and environment from unnecessary sample waste. The spring return handles also known as “deadmans” handles, the function in this case is always that the valve is (spring) return to closed position when the handle will be released. For this purpose Mechatest designed two types spring return adapters, one with 90° rotation for 2-way ball-valves and one with 180° rotation for 3-way ball-valves. For Hoke 2-way ball-valves series 7100. For Hoke 3-way ball-valves series 7165, 7671 and 7673. The 2-way function spring return handles can be mounted as spring-to-close or spring-to-open. It often happens that manual operated instrumentation ball-valves are not turned in the required position after operation. Most times this means that the valve is not closed. It can be very important (for safety reasons) that the ball-valve automatically rotates back. This can be achieved by mounting a spring return adapter on top of a manually operated ball-valve. This is particularly required for sampling valves. Spring return handles protect personnel and environment from unnecessary sample waste. The spring return handles also known as “dead mans” handles, the function in this case is always that the valve is spring)return to closed position when the handle will be released. 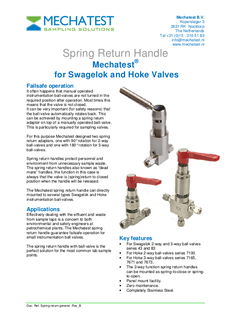 The Mechatest spring return handle can directly mounted to several types Swagelok, Fitok and Hoke instrumentation ball-valves. The spring return handles also known as “deadmans” handles, the function in this case is always that the valve is (spring) return to closed position when the handle will be released. Effectively dealing with the effluent and waste from sample taps is a concern to both environmental and safety engineers at petrochemical plants. 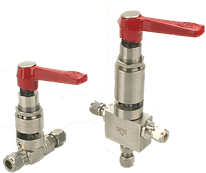 The Mechatest spring return handle guarantee failsafe operation for small instrumentation ball valves. The spring return handle with ball-valve is the perfect solution for the most common lab sample points. For 2-way and 3-way ball-valves. Since some Fitok valves has identical design as the Swagelok valves we can use our Swagelok spring return handles for Fitok valves.